September is gearing up to be a big month. The 28th alone has releases from two bands on winning streaks. 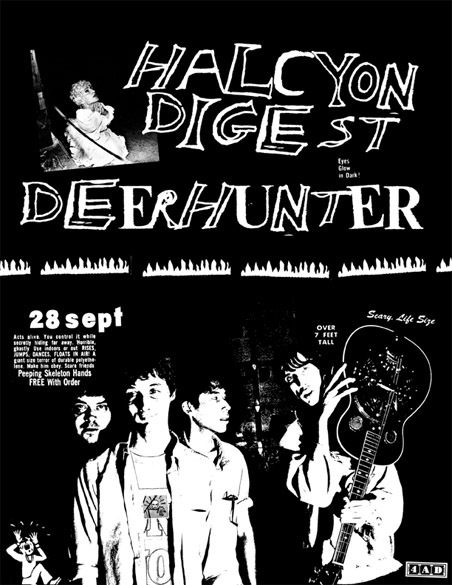 Deerhunter’s Halycon Digest and No Age’s Everything In Between. – Panda Bear has said Tomboy, the follow-up to 2007’s Person Pitch (still better than any Animal Collective album to date) will appear in September. – The first Vaselines album in more than twenty years comes out on the 14th, but without Nirvana to immortalize their songs in covers it might not be much at all. – I find the Lonely Forest pretty average and underwhelming, but their Seattle roots make them worth mentioning. They signed to major-label-in-disguise Trans a while back, and their debut on that label comes out on September 14th. – Andre 3000 has discussed releasing a solo album in early fall or late summer to follow up Big Boi’s innovative and borderline un-followable Sir Luscious Leftfoot: The Son Of Chico Dusty. Deerhunter definitely tipped off my excitement. I love Panda Bear and No Age, but Microcastle is one of my favorite albums of the 2000s. An album also means they will bring their fantastic live show around again. ~ by Andrew Baer on July 9, 2010. I get this as an Arrested Development reference, but what else are you referring to?